Wear on rings and cylinder liners leads to increased oil consumption and loss of compression, resulting in reduced horsepower and fuel economy. Independent testing shows AMSOIL Signature Series Max-Duty 15w-40 synthetic diesel oil delivers 6X more wear protection than required by the Detroit Diesel DD13 Scuffing Test for Specification DFS 93K222, delivering the security of providing your diesel the extra protection it deserves. Using top-tier synthetic base oils, AMSOIL Signature Series Max-Duty 15w-40 synthetic diesel oil is naturally resistant to oxidation and the thickening effects of soot contamination. That, along with boosted detergent/dispersant additives, keeps soot particles suspended independently, helping prevent the formation of larger, wear-causing particles. Viscosity increase is minimized and soot-related wear is controlled. Lower volatility also helps Signature Series Max-Duty 15w-40 synthetic diesel oil retain its viscosity after high-temperature service for maximum engine protection and efficiency. AMSOIL Signature Series Max-Duty Synthetic 15w-40 synthetic diesel oil resists thermal (heat) breakdown better than conventional and competing synthetic diesel oils. Unlike conventional oils, Signature Series contains no wax, staying fluid in sub-zero temperatures for easier starting, improved oil flow and reduced wear. Signature Series 0W-40 (DZF) has a broad viscosity range that offers 4X better cold-cranking ability than a 15W-40, making it excellent for use in both hot-operating engines and cold-weather starting extremes. AMSOIL Signature Series Max-Duty 15w-40 synthetic diesel oil has a low rate of volatility (burn-off), reducing oil consumption during operation and passing less oil vapor into the combustion chamber. It provides up to 76 percent less oil consumption than required by the API CK-4 standard in the Caterpillar-1N oil consumption test. 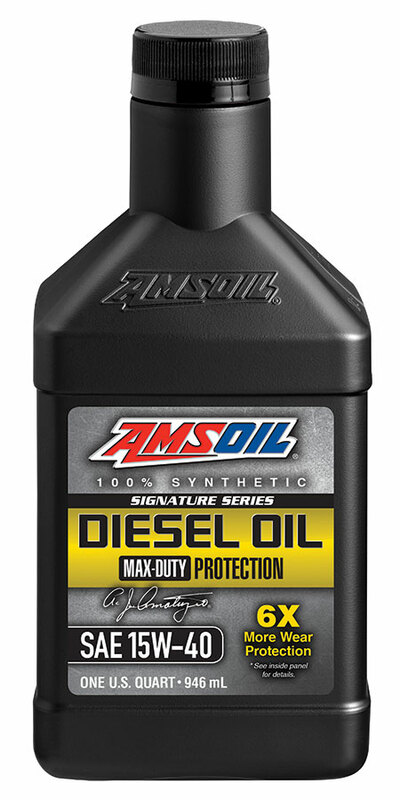 AMSOIL Signature Series Max-Duty Synthetic 15w-40 Diesel Oil is compatible with other conventional and synthetic engine oils. Mixing AMSOIL diesel oils with other oils, however, will shorten the oil’s life expectancy and reduce the performance benefits. AMSOIL does not support extended drain intervals where oils have been mixed. Aftermarket oil additives are not recommended for use with AMSOIL synthetic 15w-40 diesel oils. Turbo diesel Pickup: Two times (2X) OEM1 recommendation, not to exceed 25,000 miles or one year, whichever comes first.